Welcome to our Community Spotlight, a series spotlighting our favorite creatives that are making their mark in the world. Today we welcome Atlas Supply Co, who create honestly some of the best looking handcrafted leather backpacks I've ever seen, specifically tailored with creative professionals in mind. I was super excited to chat with co-founder Jamie Townsend to find out more about their story - read on to find out why they are focused on helping small businesses and how they wish they would have ignored all doubt and started sooner! 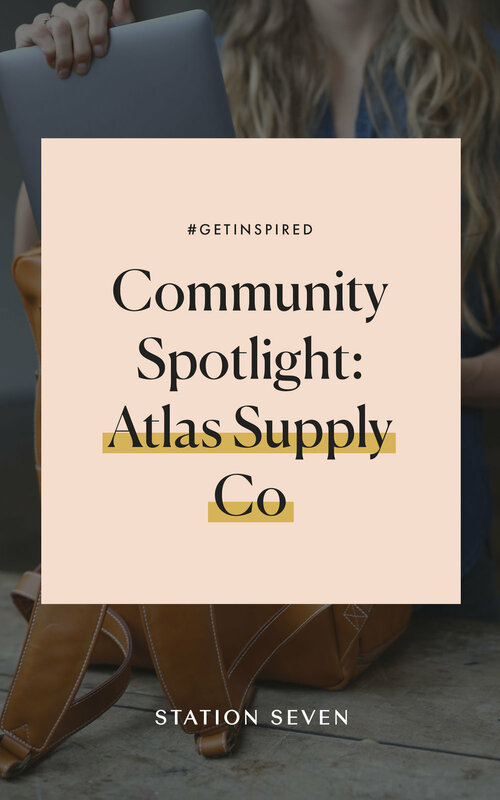 Tell us about Atlas Supply Co! We run a small shop called Atlas Supply Co. We sell handcrafted bags designed for creatives and professionals who want the convenience of a backpack but the sophistication of a briefcase. How did you get started with Atlas Supply Co? We’ve been working non-traditional jobs for about 3 years. There is no office to go to everyday, there is no set schedule of 9-5, our work is basically our lifestyle. Working with small businesses, for us, means there isn't a team of people to handle all different aspects of the operation. We are the design department, the photo department, the sourcing department, the inventory managers, the marketing department, the tech team, there are meetings to go to and all of this needs to be handled 24/7...on the go. Between packing around our camera, our laptops, and our two kidlets, we had some luggage issues. We had laptop bags that didn't fit our cameras and camera bags that didn't fit our laptops and bags that fit both but were huge and bulky and the whole lot of them were not incredibly professional looking. We felt like so many people were in the same position as us: the chronic entrepreneurs, those mom and pop shops, and those hobbyists that found their hobbies actually making them a living. There seemed to be this whole category of people that weren't being catered to in terms of their lifestyle. So we decided to fill the void ourselves. We had no experience in bag/fashion industry so we blogged our way through the process. We envision Atlas not only be a place for creative professional goods, but also a community for entrepreneurs. We hope to share resources, advice, and inspiration from some of our favorite creatives. Our biggest challenge at first was getting started. We had no experience in pattern making, leather goods, backpacks, frankly the closest thing we've come to something like this is sewing a button back on to a well-used shirt. I think I sat on it for 3 months before I finally got up the courage to start, and I truly wish that I would've started sooner. Now our biggest challenge is waiting (for product to be made and shipped). Validation. When we started, we weren't 100% sure if even one other person had a need for this pack like we did. When we started sporting around our sample bags, people walking on the street would come up to us and ask us where we got it. Security line checkers would comment on how different or cool it was. Professionals in business meetings would ask to try it out. It has been the most satisfying thing to have created something that solved not just our own problem, but others as well. We were fortunate enough to stumble upon Station Seven through Instagram and instantly fell in love with the minimal vibe. We did all the work ourselves in true small business bootstrap fashion. It was honestly the quickest easiest part of our business because the Monstera theme was exactly what we were looking for. We wanted something that was professional and minimal to have the focus on the photos of the bags, and we've gotten so many compliments on our site. It's funny how many times the saying from Miss Frizzle from The Magic School Bus has come to mind while creating our own business and helping others with theirs. Take chances, make mistakes, and get messy. It can be so overwhelming to start out and you keep thinking "it's not perfect yet, it won't work unless it's perfect". But it's not a math equation that has one answer and that's the pathway you take to success. It's a constantly changing battle of trial and error. If you love it and you want it - go for it. You can usually find us on Instagram @atlassupply.co, but you can also find us on facebook /atlassupplyco. Our business manager is @stephen_hep , our designer is @saltandember and our videographer is @janaeallred.